In the 1950s and 1960s, DSM invested heavily in research to keep up competition with companies like DuPont, BASF, and ICI. This research and the resulting industrial production were located at today’s Chemelot. Urea is a fertilizer, made from carbon dioxide and ammonia, that can also serve as feedstock for plastics and resins. BASF had begun producing urea in 1922, but DSM did not start its first urea plant until 1952. DSM developed into the global technology leader in the field of urea. The technology was licensed to companies all over the world by DSM’s licensing subsidiary Stamicarbon (which was sold to Maire Tecnimont in 2009). When DSM decided to develop a feedstock for synthetic fibers, the choice was caprolactam, a feedstock for polyamide (PA). Polyamides come in different types, and in 1938 DuPont had started producing one such type under the Nylon brand name, which has meanwhile become a generic name. IG Farben followed shortly afterwards. DSM based itself on the German process – the relevant knowledge became available to DSM after World War II through the Farben patents, handed over as part of the German reparation payments. The process started with phenol, which was obtained from coke oven gas. 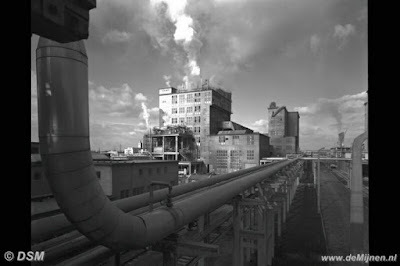 The caprolactam plant was started 65 years ago, in 1952. As a byproduct of the caprolactam production process large quantities of ammonium sulfate were obtained. Research resulted in the HPO process (hydroxylamine phosphate oxime), which dramatically reduced the quantity of ammonium sulfate. Although the research had been begun in 1965, DSM did not start the HPO plant until 1977. The time in between was needed to solve problems with respect to the chemical process, catalysts, reactors and scaling up. Almost all caprolactam was sold through the Dutch company AKU (Algemene Kunstzijde Unie), a predecessor of today’s AkzoNobel. Polyethylene (PE) was discovered in 1933 when ICI’s Reginald Gibson polymerized ethylene under very high pressure. In 1953, Karl Ziegler (1898-1973) of the Max Planck Institut für Kohlenforschung developed a second polyethylene process; in this process, ethylene was polymerized at atmospheric pressure with the aid of a catalyst. The ICI process yielded LDPE (low-density polyethylene, or high-pressure PE), whereas the Ziegler process resulted in HDPE (high-density polyethylene, or low-pressure PE). DSM had ethylene available from coke oven gas. In 1957, DSM decided to develop both the ICI and the Ziegler processes. The first LDPE plant was started in 1959 on the basis of technology purchased from ICI and Spencer Chemical Company. Plastic’s many applications substantially raised the standard of living. At some point, the quantity of ethylene obtained from coke oven gas proved insufficient, and in 1961 a naphtha cracker was put on stream – a milestone, for this was the first time DSM did not use a coal-based feedstock. In 1962, the HDPE plant was started, based mostly on new DSM technology, a further development of the Ziegler process. Giulio Natta of the Milan Polytechnic had discovered that ‘Ziegler-like’ catalysts could also be used to prepare polypropylene (PP) and synthetic rubbers. While DSM could obtain propylene from coke oven gas and from the naphtha cracker, it had problems developing a production process for polypropylene that did not infringe Natta’s patents. DSM did not start producing polypropylene until 1977. Synthetic rubber (or elastomers) is a copolymer made up of several monomers. On the basis of its HDPE know-how DSM developed the synthetic rubber EPDM, which was composed of ethylene, propylene, and dicyclopentadiene (DCPD). DSM procured a DCPD license from the Dunlop company in the UK. In 1967 – 50 years ago, the EPDM plant was started and DSM developed into a world market leader. The product (with its Keltan brand) has many applications in the building sector and the automotive industry. In 1963, Ziegler and Natta jointly received the Nobel Prize for Chemistry. Polyethylene, polypropylene, and synthetic rubber are so-called thermoplastics: plastics that become soft at a high temperature. Thermosets are a different type of plastics: they remain hard at high temperatures. In the 1920s, the Bakelite company produced the Bakelite synthetic resin, a thermoset, from phenol and formaldehyde. In 1936, Swiss-based CIBA started producing a synthetic resin called melamine, which example was followed by other companies, such as American Cyanamid. Melamine applications included the laminate on tables and counters. DSM developed its own melamine process based on the American Cyanamid production process, with urea as feedstock. In 1967, the melamine plant was started, one of the first in the world for industrial-scale production of melamine from urea. With caprolactam, polyethylene, EPDM and melamine, DSM had transformed itself from a fertilizer producer into a chemical group. The guiding principle was diversification based on existing raw materials, such as coke oven gas and ammonia, and the use of knowledge previously gained with other activities, such as mining and fertilizer production. DSM remained depending on coal for a long time, because the switch to natural gas and oil proved to be difficult. In the 1960s, coke oven gas as raw material for ammonia was replaced by natural gas, which became abundantly available after its discovery, on 22 July 1959, in the fields of farmer Boon in Slochteren, in the Province of Groningen. Not all developments were as successful, as the lysine project shows. Lysine is an amino acid that man and animal can take up almost exclusively from animal sources. So, DSM directed its research efforts towards this amino acid in 1957. Lysine was for instance tested in test animals that were kept in the vicinity of the Central Laboratory. In 1968, the lysine plant was started, but by then it had become clear that biotechnology provided an easier way to manufacture lysine than the chemical route DSM had taken. To cut its losses, the company shut down the plant after six months. Still, the failure with lysine turned out to be a blessing in disguise, since it provided the basis for further diversification of DSM in the fine chemicals sector. DSM has meanwhile divested all the activities mentioned above. The caprolactam and ammonium sulfate plant now belong to Fibrant, which positions itself with the slogan "Pure Chemistry Since 1952". The naphtha crackers and the polyethylene and polypropylene plants at Chemelot are now owned by the Saudi Arabian company SABIC, one of the largest chemical companies in the world. The rubber plant is owned ARLANXEO, since 2016 a joint venture of LANXESS and Saudi Aramco. And the urea and melamine plants are, like the ammonia and fertilizer plants, owned by OCI Nitrogen. Read also “How it started underground”, “The first transition: from coal to chemicals” and “When it went darker than in a mine shaft”. “And then there was the next Dutch winner!” is interesting too. This is a repost of my (Dutch) December 11, 2017 post. Wie wil kennismaken met de Starre Kolos?